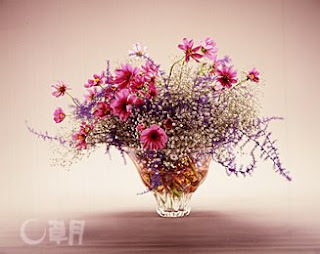 Do take those flowers when visiting somebody in the hospital, maybe an Ikebana arrangement? Or better still a potted plant!! MANHATTAN, KS—Contact with nature has long been suspected to increase positive feelings, reduce stress, and provide distraction from the pain associated with recovery from surgery. Now, research has confirmed the beneficial effects of plants and flowers for patients recovering from abdominal surgery. A recent study by Seong-Hyun Park and Richard H. Mattson, researchers from the Department of Horticulture, Recreation and Forestry at Kansas State University, provides strong evidence that contact with plants is directly beneficial to a hospital patient's health. Using various medical and psychological measurements, the study set out to evaluate if plants in hospital rooms have therapeutic influences. Studies show that when patients have great stress associated with surgery, they typically experience more severe pain and a slower recovery period. Some of these problems are treated through the use of anesthetics and analgesics, but, if not properly administered, the drugs can have side effects ranging from vomiting and headaches to drug dependency or even fatality. It is therefore beneficial to patients and care providers to develop approaches that improve the overall patient experience but don't rely on pharmaceuticals. Patients with plants in their rooms had significantly fewer intakes of pain medication, more positive physiological responses (lower blood pressure and heart rate), less pain, anxiety, and fatigue, and better overall positive and higher satisfaction with their recovery rooms than their counterparts in the control group without plants in their rooms. An interesting note to this study—the majority of patients who had plants in their rooms reported that the plants were the most positive qualities of their rooms (93%), whereas patients without plants in their rooms said that watching television was the most favorable aspect of their rooms (91%). The study suggests that potted plants offer the most benefit, as opposed to cut flowers, because of their longevity. Nursing staff reported that as patients recovered, they began to show interaction with the plants, including watering, pruning, and moving them for a better view or light. A number of studies have also shown that indoor plants make air healthier and provide an optimum indoor environment by increasing humidity, and reducing the quantity of mold spores and airborne germs. This nonpharmacological approach to recovery is good news for patients, doctors, and insurers alike in terms of cost effectiveness and medical benefits. The study provides strong evidence that contact with plants is directly beneficial to patients' health, providing meaningful therapeutic contact for patients recovering from painful surgery. 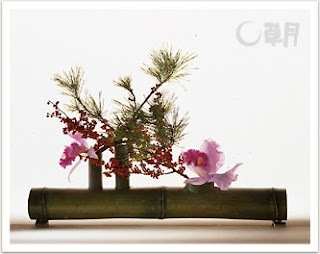 "As one of “Saikansanyu (Three Winter Favorites: pine, bamboo and plum),” bamboo is a key material for festive arrangements. With the smooth bamboo texture and neatened pine and Japanese winterberry branches, it's a very light-looking arrangement. Cattleya inserted at the end makes the point of emphasis." 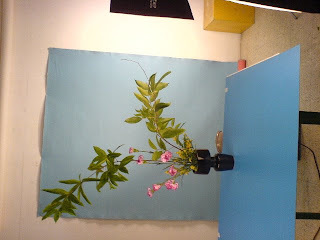 For us, it was a fascinating day, to see what a backdrop and different lighting can do to an ikebana arrangement, as a work of art. 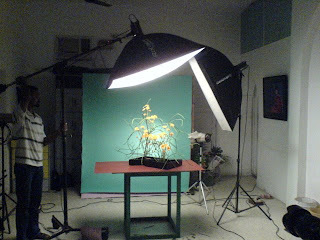 For each of these arrangements, the students would take almost half an hour, to organise the lighting, change the backdrop, shoot from different angles. 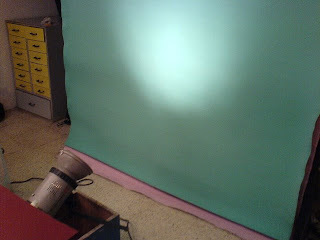 So we saw lights that hang overhead, spotlights that go on the backdrop, side lights, bottom lights, etc etc! Unfortunately, I only had my camera phone with me, and these are all the pictures I could muster! Sorry about this...it just will not straighten! 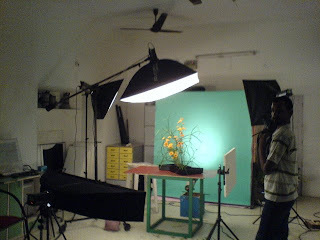 The agency has a six month photography programme, and flower photography is just one of the themes they cover. They also have a lovely Flower series, stock photos that you can purchase from them. It was my first experience with a Japanese tea ceremony here in Madras, and quite an event it was! Organised at the Japanese Consulate, it may have been sniffed at by the purists, but for us non-Japanese, it was a whiff of their culture, zen thought and philosophy. All for a cup of tea you may ask? Its not the end that matters but the process I guess! Take a look at all the implements that were involved. We were told that the whisk (that you see in the foreground) is ceremonially consigned to the temple fire, once a year in a special ceremony. Then there's a cloth to wipe the ladle, another to wipe out the guests' cup...all in all very complicated! One must make the time to relax, meditate, and calm the mind before having the energising tea! Above is the container holding the cool water. This is poured deliberately into the boiler, pictured below. During the process, one hears the soothing sound of the water trickling. And the tea is accompanied by these various Japanese sweets. Some were gelatin-based, others were redbean, and still others had a biscuity texture! 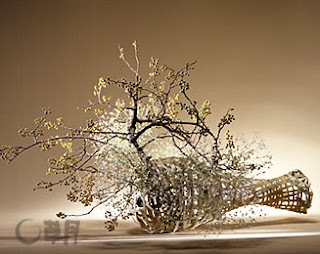 This lovely landscape arrangement was placed outside, with coconut saplings forming the major part. A no-kenzan arrangement above, and a miniature landscape below. Qumqat branches and Asia lilies - subject and object. A composite arrangement with several vases. Does any one one our group have Vase of these colours. If yes, would you please be kind enough to lend it to me during the Exhibition - If you do not plant to do an arrangement in it?? I dont need the exact shape, but the colour combination somewhat matching this will do. Thanks a lot. "Every time I see the report I feel the photoes are more gorgeous than what I saw with my own eyes, they seem as done by master of the art. Keep it up ladies and gentlemen..". Thank you so much Ma'am for such a big complement. It inspires me to become a Master of the Art. And I am sure, it does the same to others of our group. 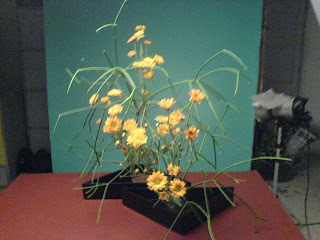 While browsing Keith Stanley's beautiful Ikebana website, I saw a blog titled "Sensei and Sensibility" and that prompts me to write the sensibility of a Sensei. I brought a Vases - a square mouthed with the 4 sides having the following : A pathway and a door, a street light, some calla lillies growing on the hedge, just a brick wall and some calla lillies . I liked the vase very much, but I was a bit taken back when I heard comments like "This is too picturey-picturey.." "I dont like it.." "I like cylindrical shaped vases only..." And so on and so on. But when I showed it to Sensei Malathi, She looked at all the sides for some time, and then slowly gave her comments. "You can display all the 4 surfaces nicely. " "This surface shows a door... You can do an arrangement that says WELCOME. You can use welcoming colours like Pink.."
"This surface shows just a street light and some calla lillies. You can do an arrangement depicting a "Street Scene"
"This surface has a brick wall and lots of calla lillies. So you can use lots of greens and do an arrangement.."
That was some sensibility from the Sensei. I learnt a good deal from this. 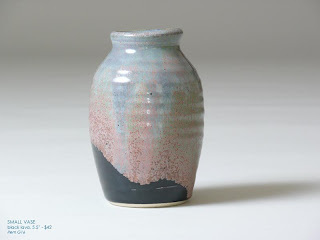 We can always focus on how to use a container/vase most effectively, than just looking at the unwanted part and rejecting the whole idea of using it :) :) That is what Sogetsu is about, isnt it? Anything, Anywhere, Anybody ?????????? Ma'am once again I express my joy that I am able to learn the beautiful art of Ikebana from you. Thank you for being there for all of us. I am adding a picture of an arrangement of Akane Teshigahara. It is described as "..Paphiopediulum serves as a single accent for this light oncidium arrangement that resembles a nest of sparrows. 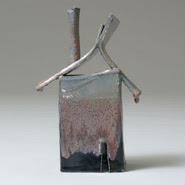 Container: Ceramic vase"
Sorry for this late post, but then better late than never isn't it?! Here are the pictures from the no-kenzan workshop we had at Trishala's place, a couple of weeks ago. The pictures were taken from a phone-cam, so they do not do any justice to all the lovely arrangements, But anyway something is better than nothing! The early birds were all done and ready when we late-comers arrived, and so we did not witness their "struggle" to balance the material and achieve beauty without the convenience of a kenzan! So, Trishala, Prerana, Seetha and Chitra sat smugly while the rest of us toiled at achieving this balance, combining the laws of gravity with aesthetics! Trishala's arrangement went vertical, while Prerana took the horizontal route, both achieving grace in their lines, with the flowers adding a lovely focus. Seetha and Chitra decided to keep it low, and created these nice table arrangements. Sorry Venkatesh, but the AC at the back could not be avoided in the picture! His purple daisies(?) 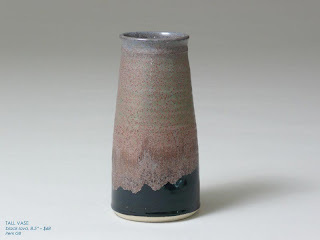 were eyed by one and all, as he artistically combined the two triangle Sogetsu vases. 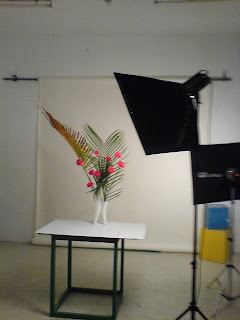 Venkatesh Meenu created this design marvel, where her branches balanced without a tripod-like effect! 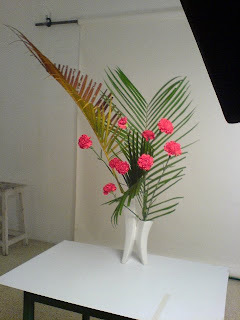 The tall carnations really give the composition elegance is it not? Meenu I used the standard tripod technique, with the long, slender and feminine copsia complementing the more masculine dressina?! Ambika And Vaishali did manage it in the end, after struggling to make these strelitzia stand, using the other thick branch did the trick, producing this dramatic and vibrant composition! Vaishali Of course, Ashok was late. And he charmed the ladies and earned his ragda patties by producing this creation-in-a-jiffy arrangement, with ficus fruits on a branch! Ashok After some great chaat and some yummy pineapple dessert we all said our goodbyes, promising to meet next month at Meenu's! 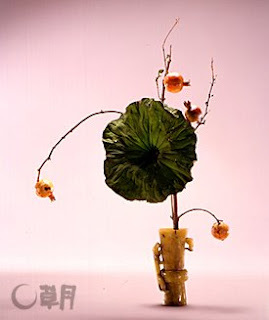 Here is an arrangement that I would create after I become an Ikebana Master. 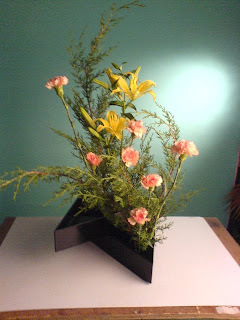 "This is a colorful arrangement that emphasizes the soaring appearance of cosmos, a flower representative of autumn." Here is an arrangement by Iemoto Akane. 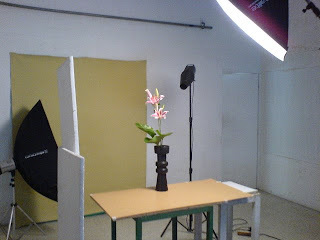 Perhaps the simplicity is the most complex thing about Ikebana ?? 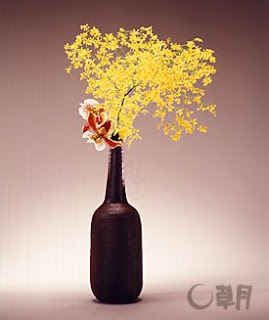 She describes this particular arrangement as "It sticks to lucid colors that emphasize the shape and originality of the gourd-shaped bamboo vase that was placed horizontally." I am fascinated with arrangements with lotus flowers or leaves. Here is a lovely arrangement by Iemoto Akane. It is described as "A powerful lotus arrangement in a small jade vase, the pomegranate fruits give movement to the overall." The Container is a Jade vase. Click on the pictures and enjoy a full-screen view. Taken on my mobile phone. The Flower is amazing, and it is no wonder that it holds a special place in Indian culture! Iemoto Akane arranged flowers for the G8 Hokkaido Toyako summit. She also created an outdoor bamboo installation with members of the Hokkaido branch. The September workshop was hosted by Seethalakshmi at a farmhouse near Muttukadu, and it was a enjoyable morning, for besides the Ikebana, we saw a stone art gallery on the farm, went to the beach, had refreshing yelaneer, and a sumptuous lunch! Thank you Seetha! We were joined by the ladies from the Japanese Consulate, including Ms Minagawa, as well as her French guest Claire, who brought along 2month old Theodore, who was most adorable, and quickly developed a huge female fan following among us! The material in focus was casuarina, which grows on the farm, and there was also some lotus available. Ashok used both in this creative composition below. For me, the amazing aspect was the stiffness of the lotus stem. It did not need to be wired or anything! (I have used it at home now, and the lotus has stayed erect as a bud for the last two days! Seetha created this moribana arrangement, with red roses contrasting the yellow vase, and the brown berries providing a nice accent to the tall casuarina lines! A no-kenzan creation by Molly (and Meenu?). Our guest Claire also took part. She is of the Ohara school. Trishala used jerberas wired together for a special dramatic effect in this glass vase. In the arrangement below, she used only the berries of the causarina as her main lines. 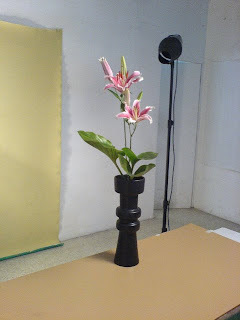 Vaishali's elegant wooden vase was complemented with this lovely linear composition above, while Chitra was thrilled at receiving Sensei Malathi's complements for her creation below!! 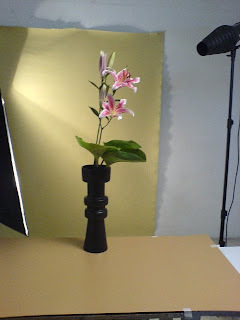 Meenu worked with an elegant tall Nagiere vase, with an interesting mouth (above), while Prerana did Moribana this time. 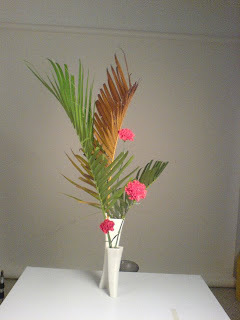 This is my attempt at using the "untidy" appearance of the casuarina to develop a them of wild and natural, combining white, yellow, brown and green, highlighted by the red of the carnation. All (except me who was too lazy!) then went off to get their toes wet in the cool waters of the Bay of Bengal, walked to the top of a landscaped hillock to take in the view, and explored the lotus pond for more flowers! Next workshop - 13th October at Trishala's residence! No-kenzan arrangements. And no, Nagiere not allowed!